Guess the correct number of lights on the tree. Can you count the lights on the 2017 Birch Ridge Inn Christmas Tree??? The holidays are charging at us! With great fanfare to a room full of well wishers, the 2017 Birch Ridge Inn Christmas Tree was officially lit on Saturday. This years tree is the "Formal" tree decorated with white lights and crystal ornaments. The tree measures in at just over 14 feet from floor to ceiling, and is covered in lights. So many lights, that 2 different electrical circuits are required to drive the tree. It has become a Christmas Tradition at the inn to have our guests and many locals come and have their pictures taken beneath the tree. This year, we are happy to introduce a fun contest around the tree. All you need to do is guess the number of lights used to illuminate the tree and you have a chance to win a Champagne Chefs Dinner for 2 at the inn. The rules of the contest are very simple. Just visit the inn and fill out a contest entry form with your best guess. Using "Price is Right" rules, the person who guesses the closest to the correct number of lights on the tree, without going over the number, wins. You can fill out your entry form any day during the holiday season, right up to 9:00 PM on Friday January 5th. The winning entry will be announced in the Great Room on Saturday January 6th at 6:30 PM. No purchase is necessary and you do not need to be in attendance to win.... but you must come to the inn to get your entry form to enter the contest. In addition to all of the activites around the Christmas tree and decorating the inn for the holidays, we did have a chance to get out on the mountain for a few hours to get the ski muscles moving. 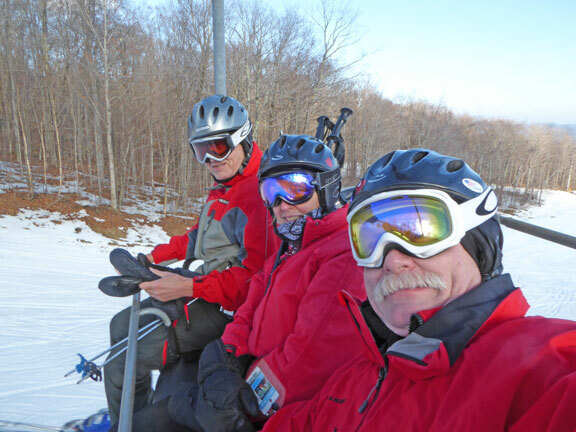 The "Bagel", after a brief hiatus away from Killington with the end of golf season, returned to take a few runs on the mountain with us. Conditions on Monday all across the mountain were great, even though we have not received a significant amount of natural snow yet this winter. The Killington resort has been going all out to make snow across all of the mountain. And it showed with a great day of skiing on Monday. The Bagel joins us on the Snowdon Quad as we take our Monday turns on the mountain. With the passing storm front that went through the area last night and today, temperatures across the mountain are getting decidely colder. Lake effect snow is cranking up over the Great Lakes which also usually brings some snow to the mountain. With "Winter" officially due to arrive in a couple of weeks with the Winter Solstice, the time is now to plan your trips to Killington to enjoy the mountain.